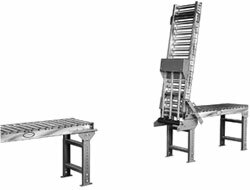 Manual gates are available for use with a variety of conveyors. Gates provide a passageway for personnel, lift trucks, and other equipment. 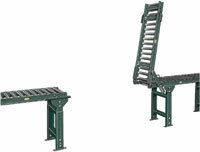 Manual gates are available for a broad variety of conveyors. They’re hinged on one side and must be unlatched before lifted. While they are relatively lightweight, longer, heavier sections might be difficult for some people. Standard models come in 3’, 4’ and 5’ lengths, with overall widths from 12” to 24” for skatewheel and 1-3/8” models, or roller widths from 13” to 39” for 1.9” rollers. Roller centers are set to match the needs of your load and application. Spring balanced gates can be used with several types of gravity wheel and roller conveyor. Gates provide a passageway for personnel, lift trucks, and other equipment. Equipped with adjustable tension springs, which help you lift the gate. This is important for gates that are being used by people who might not be able to lift a manual gate, or frequently-crossed lines where you’d like to provide a little ergonomic help. 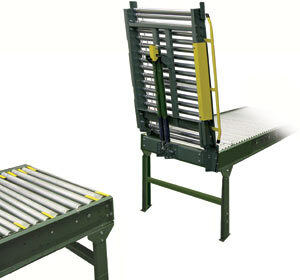 A new design makes power roller lift gate more effective and easier to use. Hytrol's new powered gate replaces traditional powered gates used in the conveyor models 190-ACC, 190-NSP, and 190-NSPEZ. This gate uses a die spring to assist manual opening and closing for powered conveyor systems. When raised, its rollers automatically disengage. The rollers reactivate and continue to convey products once the gate is closed.